A. Starter workstation. 24D x 60W x 76”H. Accessories include overhead utility chase, (2) upper adjustable shelves, power channel, phenolic resin worksurface and mobile storage pedestal with resin top. B. Starter workstation. 30D x 72W x 76”H. 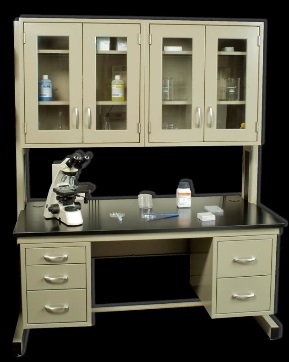 Accessories include (2) overhead steel lab cabinets, epoxy resin worksurface, dual suspended steel drawer units, footrest. 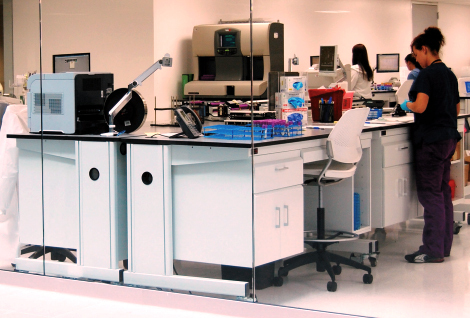 C. Bench height workstations, diagnostic lab. Single-sided, 36D x 72W x 36”H, set back to back. 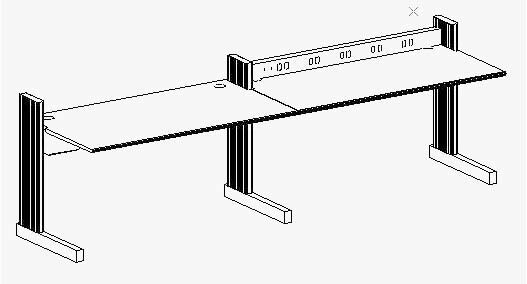 Accessories include suspended combo drawer/cabinets, column pass thru to accommodate optional power/data ‘daisy chain’ linkages. 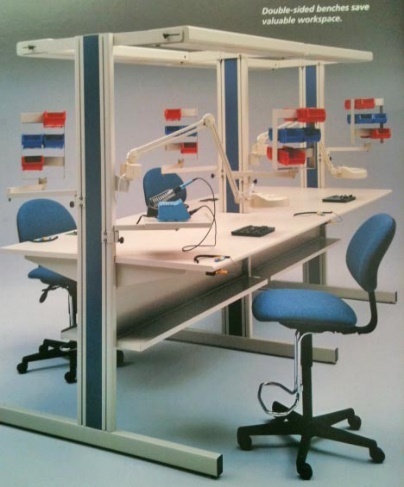 D. Workstation system with (3) connected units. Overall width is 10’-6”. 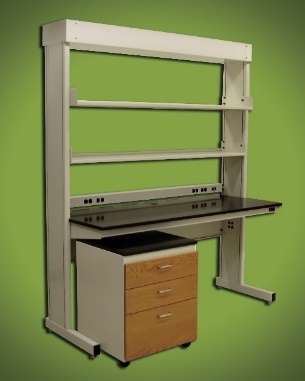 (2-4’ workstations on ends with 30”W peninsula). Accessories include overhead storage cabinet, upper adjustable shelves, power backsplashes with power thru column, plug into floor outlet. Also articulating keyboard trays, mobile storage pedestal, roll out floor shelf. 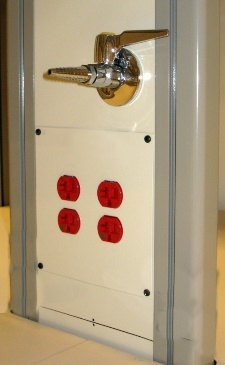 E. Power/data panels installed in column. Locations can be above or below the worksurface. Columns function as chases for electrical, data, conduit, etc. F. Double-sided ESD test/assembly workstation. (1) starter & (1) connected add-on. (Shared middle column). 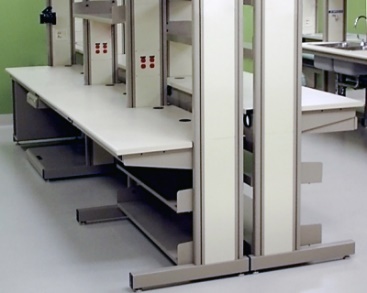 (4) 30” x 72” ESD worksurfaces. Each unit is 72”W x 60”D. (12’W overall). Accessories include overhead task lighting, column mounted articulating magnifier light, articulating bin holders, lower shelves. G. Starter/adder mid column height workstations. Each 30D x 60W x 36”H. Worksurfaces set at 30”H, leaving room for power backsplash between the columns. Note: worksurfaces, power channels, etc. are adjustable up/down columns. Alternative column heights are readily available. 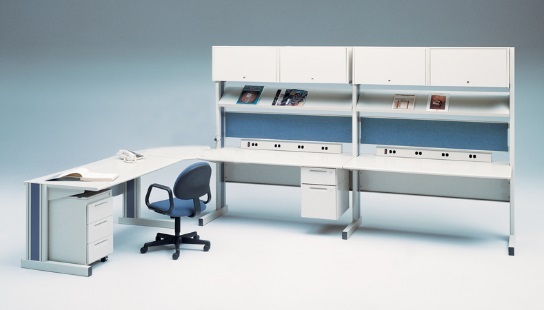 H. Connected “L” configuration with desk height unit on left, corner worksurface, and tall starter/adder workstations on the right. Accessories include upper storage cabs, adjustable shelves (set at angle), fabric privacy/tack panels, power strips, suspended and mobile drawer modules. I. 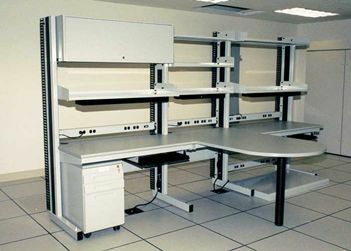 Two rows of (3) connected single sided high column workstations, positioned back to back. Worksurfaces set at different heights on each side. Accessories include lower shelves, panel mounted power modules, upper shelves.